Paige Bradley (Carmel, California b. 1974) has always had a fascination with the human body from a very young age. She is mostly known for her sinuous, bronze figurative sculptures. Bradley's humanistic betrayals of emotions and common life struggles deliver a strong connection with the audience. Such raw and powerful visuals immediately captivate one's attention and undoubtedly triggers an emotional response. At least for me, I believe it was a success. The process behind this piece is quite fascinating. Bradley had intricately sculpted a woman meditating in the lotus position; a perfect and untouched wax sculpture. By dropping it on the floor several times with pieces shattering everywhere; this work of art was one step closer to becoming the masterpiece it is today. 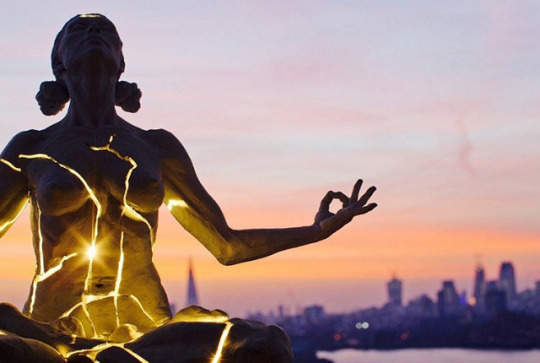 By casting the pieces floating apart in bronze and adding a lighting system, "Expansion" came to life and became one of my favourite sculptures. There is undoubtedly an emotional tension and spiritual depth within Bradley's body of work; especially because her art explores themes of self-inflicted boundaries as well as freedom and liberation. A common struggle that the human race faces in this sculpture, beautifully portrayed by the flawless marriage of elements that Bradley put. What do you think about Bradley's work. Comment your opinion. Images courtesy of Paige Bradley.